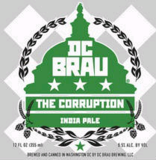 The Corruption is our take on an India Pale Ale (IPA). We will corrupt your palate with dangerously drinkable malts as well as assertive piney and citrusey hop aromatics, letting some alcohol and sugars sneak through. This is one shady deal that you won’t be able to pass up!